It was not long ago that stem cells were considered a futuristic treatment of fiction and fantasy. However, University of Guelph researcher Dr. Koch and his team are now well on their way to making stem cell treatments for horses a reality. “The tool box is equipped,” says Koch. They have been successful in creating cartilage from stem cells. All the laboratory work testing the potential use of umbilical cord blood for generating stem cells has shown great potential for healing cartilage injuries. 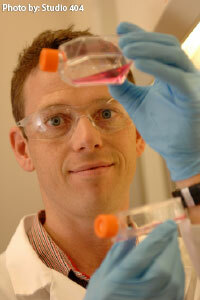 Koch and his team are now poised to begin in vivo studies. Koch credits Equine Guelph’s early funding and interest for helping raise awareness of his research and bringing it to the forefront of the industry. The latest grant of $750,000, provided by the Canadian Foundation of Innovation – Leaders Opportunity Fund will build a new regenerative research laboratory at the Ontario Veterinary College. The pièce de résistance of Koch’s new 1200 square foot laboratory is certainly the new bioreactor. One of only four of its kind in Ontario, the bioreactor has four chambers, which will allow for control testing. Not only will it allow for greater testing and screening, but it will also be able to mature cartilage by asserting the same kind of pressures new cartilage needs to withstand inside the horse. The goal is to create a cartilage that will stand up to the pressures of wear and tear by undergoing these initial treatments in the bioreactor. In addition to new technology, the regenerative research laboratory has other benefits. The large workspace is the perfect place for learning. Koch has seven students on his team and he stresses the importance of training qualified personnel. Funding from Equine Guelph, as well as others, has allowed for a large number of undergraduate and graduate students to become involved in regenerative research. June 2013, marked the first safety test on a live horse using stem cells generated from umbilical cord blood by Koch and his team. They injected the stem cells into the horse’s injured tendon. Twenty million cells were injected into the defect with ultrasound guidance, and no apparent negative impacts have been noted in the first five weeks after treatment. “The horse never looked back,” says Koch, “It has just been happily eating, with no increase in lameness.” Swelling did reduce, but at this time Koch is unable to say if this was a result of the injection. The horse will be re-evaluated at the Ontario Veterinary College three months after the initial treatment. Professors Judith Koenig and Heather Chalmers are the surgeon and radiologist, respectively, that Koch has teamed up with to ensure consistent application and evaluation of stem cell therapy in live horses. While the first injection was primarily a safety test to ensure there were no adverse effects, it has opened to door to further in vivo testing. This, alongside the new laboratory and bioreactor, has put Koch at the head of equine regenerative research. Clinical trials, enrolling horses with lesions, will be the next step in this exciting new research bringing Koch and his team closer to making stem cells a viable treatment option for horses with variable injuries for which there is none or suboptimal treatment options today. Dr. Thomas Koch is an assistant professor in the Department of Biomedical Sciences at the Ontario Veterinary College and an adjunct associate professor in the Orthopedic Research Lab at Aarhus University in Denmark, His work is funded by the Danish Research Agency for Technology, Production and Innovation, Grayson Research Foundation of Lexington, Kentucky, BioE Inc. of Minnesota, USA, SentrX Animal Care Inc.of Utah, USA, and Morris Animal Foundation (USA), the Canadian Foundation of Innovation – Leaders Opportunity Fund, Pet Trust and the Equine Guelph Research Fund.